Faith makes all things possible; love makes all things easy. Ok. We have birthing and restraint and rainbows and pyramids and all kinds of interesting tinker toys nestled in our fingers. Is there some commonality here, something that binds them all together? A place that assembles them into a whole? I think that there is. The restraint placed upon men is found in Genesis 11. There, men gathered in Shinar and built a tower. This tower was found at a place called Babel. The location and name given are commonly thought to refer to the city called Babylon. A temple called the White Temple topped the ziggurat in the ancient Sumerian, later Babylonian, city of Uruk. A white capstone standing upon a pyramid that connected heaven and earth. 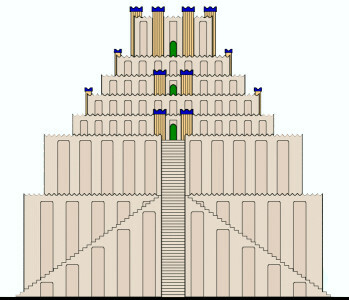 The ziggurat was a tower that men believed connected heaven with earth. It would allow the power of God, or the gods, to be given to men. If men were to be restrained, then according to this belief, it would have to happen through some act that bore against the connection alluded to by the ziggurat. Previously I made the statement that the rainbow diagram was a visual representation of faith. The writer of Hebrews tells us that the worlds were made through faith. We also know from the creation account found in Genesis, as it is succinctly put by many, that God spoke the worlds into existence. Faith and speech are a braided pair. Scripturally, God imputes the ability of man, in the tower of Babel account, to man’s one language. One language and faith are synonymous. Faith makes all things possible. If you are going to restrain man, you have to restrain his access to faith. So the Lord confused this one language, man’s faith. 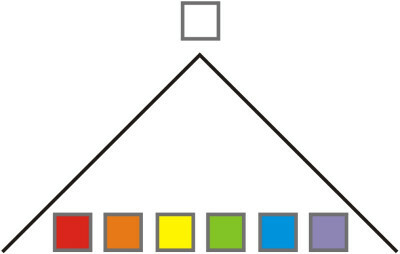 The rainbow diagram is a visual representation of faith, or a visual representation of the ability to do all things. A visual representation of the creative power of God. If you hear someone speak on the time when God will release new colours, what they are referring to, though they are probably unaware, is the time when restraint is broken. A time that creativity is restored. A time that faith is unleashed. Soooo true Gregg! I have been thinking the same. I have noticed a pattern emerging in the blog where patterns are often the common thread stitching it all together. Sarcasm aside, one seems to keep emerging as i read the bible. Alot of the old testament traditions and events are a foreshadowing of something to come in the New testament. Sometimes a replacement or reversal of events will follow in the New testament as well. Perhaps the day of Pentecost where they all spoke in tongues and others understood was a reversal of what happened at Babel. just a thought.